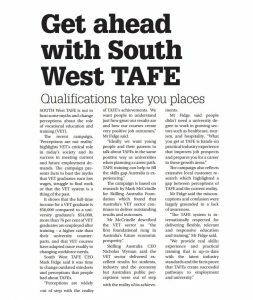 South West TAFE is out to bust some myths and change perceptions about the role of vocational education and training (VET). The recent campaign, ‘Perceptions are not reality’ highlights VET’s critical role in today’s society and its success in meeting current and future employment demands. The campaign presents facts to bust the myths that VET graduates earn low wages, struggle to find work or that the VET system is a thing of the past. 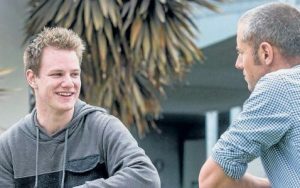 It shows that the full-time income for a VET graduate is $56,000 compared to a university graduate’s $54,000, more than 76 per cent of VET graduates are employed after training – a higher rate than their university counterparts, and that VET courses have adapted more readily to changing workforce needs. South West TAFE CEO Mark Fidge said it was time to change outdated mindsets and perceptions that people had about TAFEs. “Perceptions are widely out of step with the reality of TAFE’s achievements. We want people to understand just how great our results are and how our courses create very positive job outcomes,” Mr Fidge said. “Ideally we want young people and their parents to talk about TAFEs in the same positive way as universities when planning a career path. TAFE training can help to fill the skills gap Australia is experiencing.” The campaign is based on research by Mark McCrindle for Skilling Australia Foundation which found that Australia’s VET sector continues to deliver outstanding results and outcomes. Mr McCrindle described the VET sector as “the first foundational rung in Australia’s future economic prosperity”. Skilling Australia CEO Nicholas Wyman said the VET sector delivered excellent results for students, industry and the economy but Australian public perceptions were out of step with the reality of its achievements. Mr Fidge said people didn’t need a university degree to work in growing sectors such as healthcare, tourism, and hospitality. “What you get at TAFE is hands-on practical industry experience that improves job prospects and prepares you for a career in these growth areas.” The campaign also reflects extensive local customer research which highlighted a gap between perceptions of TAFE and the current reality. Mr Fidge said the misconceptions and confusion were largely grounded in a lack of awareness. “The TAFE system is internationally respected for delivering flexible, relevant and responsive education and training,” Mr Fidge said. Follow this link to download Skilling Australia Foundation’s ‘Perceptions Are Not Reality’ report.